A sparkling 1/3ct I-I1 colour and clarity diamond solitaire, styled in 18ct white gold with glittering diamond set shoulders. Handcrafted by leading diamond cutter Leo Schachter, the Leo Diamond is cut to reflect light like no other diamond. With its unique facet design, it is the first diamond to be independently measured for its fire and brilliance. 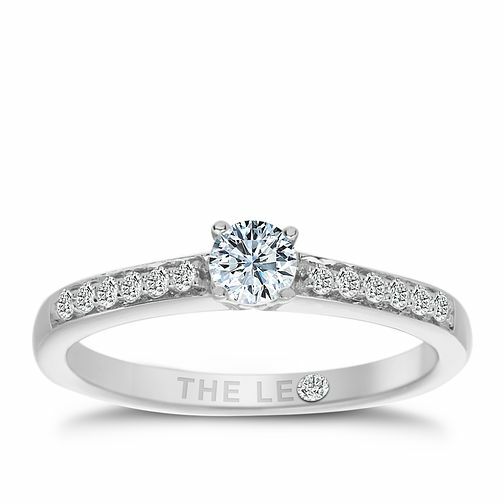 Leo Diamond 18ct white gold 1/3ct I-I1 solitaire ring is rated 5.0 out of 5 by 1. Rated 5 out of 5 by Anonymous from Stunning I received this ring a few months ago when my fiancé proposed to me, the ring is simply stunning and shines like nothing else. The diamond is so bright and glimmers in the sunlight! Beautiful! !